Flexible hug light keeps hands free. Wear it, wrap it or hang it for reading, outdoor safety and more. White and red lights with adjustable brightness levels preserve night vision without disturbing others. High-density, bright LED lights illuminate a wide area. Reading light's flexible arms direct light where you need it. Padded neck and arms for comfortable wear. 23"L with bonus activity band for a secure fit. Durable ABS plastic and urethane foam. LOVE LOVE IT, BEST READING LIGHT EVER ! I LOVE this reading light. I can read in bed, without my sweetie complaining. The fact that it automatically goes off makes it the BEST ever !!! I don't have to worry about waking up to a dead battery - or 6. Most bed lights forget that you use them to read yourself to sleep. 8 hours latér, the batteries are dead. This one turns off, and is easy to turn back on again, if you haven't fallen asleep. Easy- peasy. I will be buying these for gifts, could NOT be happier !!! This is great. I used to have to get up to turn the lights off before bed-time. No more! With my Hug Light it's lights out, then I can read a bit without having to get up. Excellent! I put it on before church and forget about it until needed. This is so much better than the clip on light I had previously. I love having 3 levels of brightness. It is so much easier to do the readings at church services, with the mic in one hand and turning pages with the other. 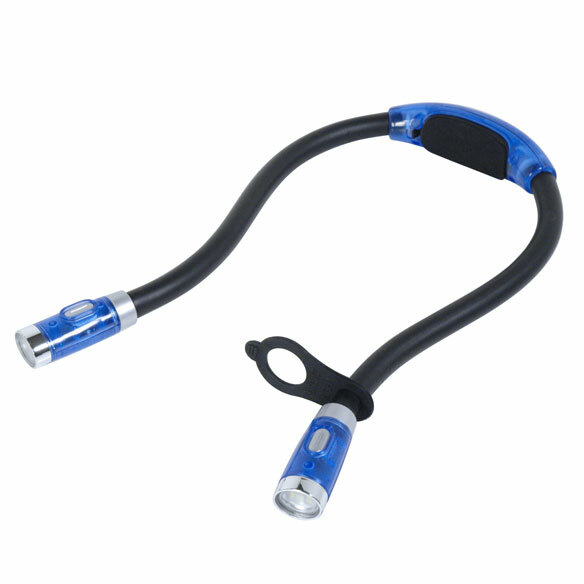 I will buy it again and recommend it to other s.
Light weight and no hand holding. This is a handy, light-weight & portable method of providing light. This is perfect for doing crafts. Being able to adjust the 'handle' is great, I can pinpoint it where I need it. I only wish the light did not time off. I do crafts for several hours at a time and having to turn it on again and again is a little distracting. I ordered one to try it out, and my husband loves it. He reads a lot and tinkers with small objects and this light works great! I was so impressed, I ordered one for the upstairs and a spare! I would highly recommend this product! When it's dark at night and I don't want to turn on an overhead light, I just use this. It shines right on my computer keyboard. What a great invention! I wear this light in the evening when the sun goes down and my living room becomes darker. I can see the print in magazines and I can even do crafts like crotcheting!! Which I could not do before I got this light. Even though there is a lamp alongside the chair I sit in this provides light right on the subject. A nice bright light that's comfortable to use! 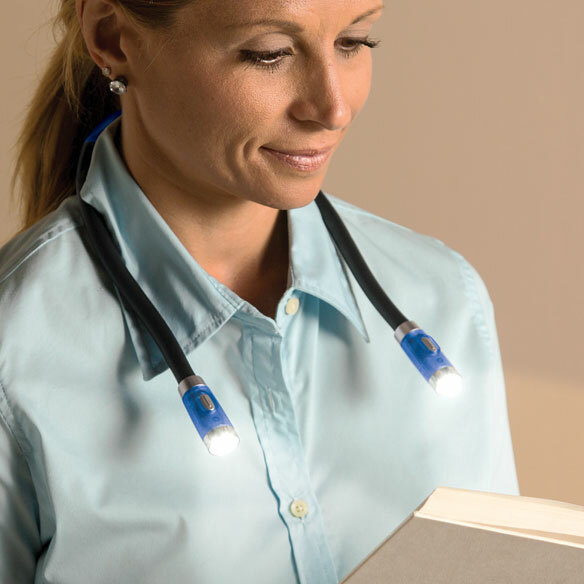 Love the idea of a neck light instead of fastening it on a book. Covers both book pages with a very bright light. never have to enter a dark room. I bought this for my grandson, he'll use it at night for reading and won't disturb his roommate. I use this to read with or to walk down the hallway at night without turning on lights to bother anyone. I should have ordered several more as my kids keep borrowing mine! Use this for crafting. Plus manicures and some reading. Perfect gift for someone in hospital or nursing home. light to read by. I ordered me another one. I like it!!! It makes doing thing when you need your hands free but need a light!!! We take our hug lights on trips and end up giving it to friends and have to order more. We like the red light for finding our way in a new motel room in the middle of the night. It doesn't wake up my husband when I have to get up. I use it to read in bed at night. It has 3 levels of light, including red light. Just put it around your neck and aim beams. I feel like I DO have to adjust it more frequently than I should have to. Wanted for reading in bed and meets expectations. adult to wear around the neck,like l wanted it for. I read in bed before going to sleep. Sometimes my husband wants to come to bed before I'm ready to put my book down. This light allows me to continue reading without keeping him awake. Novelty. I want to try it.to see if I have a use for it. I thought that this would be a big help to a friend who has macular degeneration. So I can read in bed without waking spouse. To gain a hands free light source when doing needlework. I'm looking for a way to light my hymnal in church where the lighting is very poor. Also it will make it easier to see my knitting in detail. Enjoy reading in bed. Bought some gifts.. I read in bed at night before going to sleep, and my bedside lamp can only use a 40 watt bulb, which strains my eyes after just a short period. I thought this might be a good solution to that problem. Because sometimes, I could use a little extra light, when I'm reading, or on my laptop. For reading at night so I don't need a lamp on. Very useful for jewelry making. I use a loom to bead with and this looks like it will help with lighting. I think it is a fantastic concept and just what I need for reading in bed without disturbing my partner. This is my second order for this product and I am hoping it will be better than the first. The batteries did not fit in when using the cover. I had to tape them in. The lights did not last long. So I am able to read even though there is not a close lighting fixture or lamp. I wanted a light near my recliner for reading but had no room for a table lamp. This small light will be perfect for my needs. I prefer items that are practical to use. Great for nighttime reading when I don't want to disturb others. I make jewelry and, although my work bench is well lit, sometimes I need a little spotlight on my work to see what I'm doing and this seems like it would work well. looks like a great way to read in bed. I bought one of these lights for myself a couple of weeks ago, and my mother loved it when she saw it...so I'm getting one for her now. It is different from other forms of flash lights that I've used. Wanted to give this a try. Should be more useful than a book light and hopefully provide light for needle work. Clip on is too inconvenient. This seems better. I could flip the pages of the book I'm reading without worrying about the light. I need more light for reading. Hope it works. How can you purchase replacement bulbs? BEST ANSWER: I have never needed to replace the bulbs, only the batteries. They are LEDs and should last a long tiime. Mine is coming up on 2 years old. Thank you for your question. We do not sell replacement bulbs. We hope this information will be of help to you. I am sorry I have no idea. BEST ANSWER: Yes, the lights are bendable. I use mine directed to my lap to read or knit. Yes, light is very bendable in all directions. Yes, the lights are very flexible.